Comvita� UMF� 18+ Manuka Honey is produced in New Zealand and contains unique plant phenols. Comvita� UMF� 18+ Manuka Honey is guaranteed to be at least UMF� 10+ and has been verified by an independent testing laboratory. Take 10g (1-2 teaspoonfuls) of Comvita� UMF� 18+ Active Manuka Honey 4 times a day. Alternatively, can be used as a delicious spread. 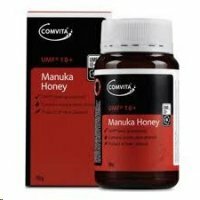 Comvita� UMF� 18+ Manuka Honey contains pure New Zealand Manuka Honey.